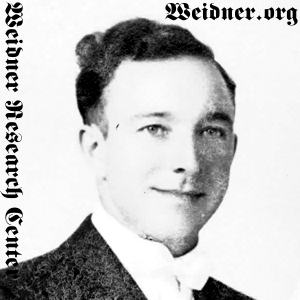 Peter Albert Weidner. Courtesy of Raupp Memorial Museum, Buffalo Grove, Illinois. [S11] John J. Weidner, Compiled Birth, Death, 688 birth date only. [S503] Mary Ann Weidner, "Peter Albert Weidner Family Group Sheet", This family group sheet was partially completed by John Joseph Weidner. Additional information was provided by (Sister Yvonne) Mary Ann Weidner., birth date and location. [S969] Chicago Tribune, 05 Mar 1996, sect. 2, p. 9, col. 3, No marriage date or location. [S11] John J. Weidner, Compiled Birth, Death, 688 Last name is difficult to read and may be previous marriage name. States they were married 15 November 1980. [S503] Mary Ann Weidner, "Peter Albert Weidner Family Group Sheet", This family group sheet was partially completed by John Joseph Weidner. Additional information was provided by (Sister Yvonne) Mary Ann Weidner., Marriage date only. [S228] Daily Herald, 28 Oct 1996, sect. 5, p. 2, col. 5, listed as deceased. [S405] The Cemetery Committee, Vernon Township Cemetery Inscriptions, Lake County, Illinois, 116 death year only. [S503] Mary Ann Weidner, "Peter Albert Weidner Family Group Sheet", This family group sheet was partially completed by John Joseph Weidner. Additional information was provided by (Sister Yvonne) Mary Ann Weidner., death date and location. [S405] The Cemetery Committee, Vernon Township Cemetery Inscriptions, Lake County, Illinois, 116 burial location only. [S503] Mary Ann Weidner, "Peter Albert Weidner Family Group Sheet", This family group sheet was partially completed by John Joseph Weidner. Additional information was provided by (Sister Yvonne) Mary Ann Weidner., burial date and location. [S969] Chicago Tribune, 05 Mar 1996, sect. 2, p. 9, col. 3, Burial date and location.